The #1 choice for home buyers and sellers in Northern VA.
National Realty is based in Reston, Virginia which is in Fairfax County in the Northern Virginia suburbs of Washington, D.C.
National Realty company provides customers with personalized assistance for home buyers, home sales and rentals. National Realty is a family owned, independent firm that has been in business since 2003. Since that time, they have grown to become one of the leading single office companies in all Northern Virginia with over 130 active real estate agents. Agents live throughout the area so customers can be assured that there are agents to assist them in all Northern Virginia cities. The company provides services for home sales, rentals, commercial property and land sales. National Realty is licensed in Virginia, Maryland and Washington, D.C. They also assist with real estate referrals nationwide. National Realty is based in Reston in Fairfax County. Fairfax County, Loudoun County, Arlington County, Alexandria City, Falls Church City, Fairfax City, Prince William County, Manassas cities and Fauquier County. 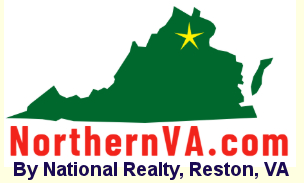 They also provide real estate services for areas farther west and south of the DC/Northern VA area including Fredericksburg, Front Royal, Warrenton, Culpeper and other areas closer to the Shenandoah Mountains. They also serve Washington, D.C. and the Maryland suburbs of Washington. National Realty is located in the planned community of Reston, Virginia in Fairfax County. The office is centrally located between Washington, D.C. and Dulles Airport. It is only a couple blocks from the Dulles Toll Road and Reston Station of the Silver Line Metrorail. The address is 11890 Sunrise Valley Drive, Reston, VA 20191. The office is a modern free-standing building with multiple conference rooms, large screen monitors for home viewings and over 70 outdoor parking spaces. The building is owned by the brokers of the company. Reston is a planned community with over 50 miles of pathways around lakes, golf courses, swimming pools, tennis courts and open space. Reston also has a fast-growing town center with a wide variety of restaurants and mixed development. The National Realty office stands very nearby to some of the largest high-tech companies in the country such as Oracle, Microsoft, Bechtel, Sprint and many more. While these buildings are huge, the National Realty office maintains its easy access, one story building with over 70 parking spaces at the corner of the high-tech section of Reston. National Realty is owned by two real estate brokers and brothers, Paul and Keith Hartke, who have a combined real estate experience over 40 years. Keith Hartke obtained his license in the 1970s. Paul switched from his legal career to join Keith in the 1990s. They have previously been owners of a multi-office Century 21 franchise and later became manager/brokers at Coldwell Banker. They opened National Realty in 2003 and, despite the “National” name, provide local assistance primarily in Northern Virginia. Paul Hartke is the principal broker, webmaster and Virginia attorney. Keith Hartke is the sales manager and one of the top real estate negotiators in the area. The Hartke brothers provide their agents with hands-on, personal assistance for their agents for sales and rental transactions. National Realty has a long history of providing community service to the region. Annual official sponsor of the Marine Corps Toys for Tots campaign in the region with their popular drop-off location in Fairfax County. Toy donation campaign has extended to benefit Reston Fish, a non-profit organization to help needy children in the immediate area. Annual 15 year + Sponsor of the annual Reston Triathlon as well as the Reston Sprint Triathlon that is held for region-wide athletes. Proud sponsors of local area high schools including their home town athletic team, the South Lakes High School Seahawks. Sponsor of Rescue Reston, a non-profit whose purpose is to preserve open space in the area. They have also sponsored local golf tournaments for non-profits in the area. Provides its large parking lot for annual Christmas tree sales and has provided space for local farmers markets. National Realty has hosted a huge “Beach Party” on one of the owner’s lakefront homes for hundreds of past customers, clients and our agents. The Spring time party has a 22 piece steel drum band, barbecue cookout, swimming pool, and boat rides on the lake. National Realty is proud to be involved in community service in Northern Virginia.